"Truth, Justice and the Gambini Way"
My Cousin Vinny is a film involving a pair of university students, Billy and Stan, who wind up inadvertently being tried for a murder at an Alabama gas station. 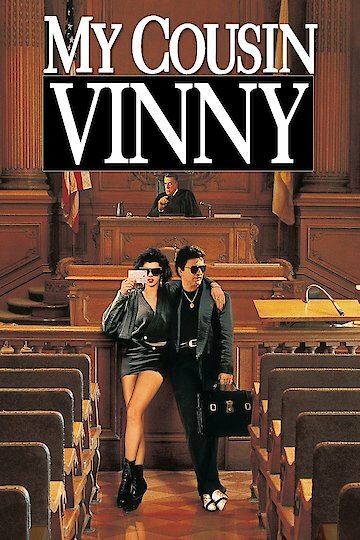 Billy calls his mother from prison, where she informs the boys that Billy has a lawyer in the family, cousin "Vinny." Vinny heads to Alabama with his fiance, Mona Lisa Vito. Although willing to take the case, Vinny only has experience with personal injury cases. Further, he's only recently been added to the bar with no actual trial experience. Although Vinny is able to con the trial judge, his lack of knowledge regarding court procedures, as well as his aggressive attitude, soon get him into hot water. Against Billy and Stan's wishes, Vinny doesn't cross-examine anyone during the probable cause portion of the hearing. With Vinny's poor showing, Stan fires him and asks for a public defender, while Billy stays with Vinny. During the trial, Vinny's interrogative methods completely discredit the first witness' testimony, restoring Billy's faith as well as Stan's. Stan fires his stammering public defender, once again asking for Vinny's representation. Vinny's continues proving his clients' innocence until an FBI analyst is called to the stand. The analyst testifies that tire marks leaving the crime scene match with Billy's Buick Skylark. Flustered, Vinny eventually recognizes that some wide photographs from the scene are the key to the case. Unable to testify this himself, he pleads with his fiancé to do so, as a former mechanic. During Vinny's questioning on the next day of the trial, Lisa remarks that the tire marks belong to a Pontiac Tempest and not a Skylark; Skylarks apparently lack a suspension system capable of leaving tire tracks matching the getaway vehicle's. Further, said Tempest contained a firearm matching the caliber of the murder weapon. All charges are dropped. My Cousin Vinny is currently available to watch and stream, download, buy on demand at IFC, Amazon, Vudu, Google Play, iTunes, YouTube VOD online.